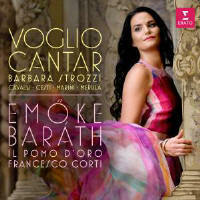 Having impressed on previous Baroque releases for Erato (Handel’s Partenope and Philippe Jaroussky’s ‘Storia di Orfeo’ composite, 12/15, 4/17), the Hungarian soprano Emo˝ke Baráth has emerged with her own contract, of which this release is the first fruit. And how nice it is to welcome not a disc of the same old Handel arias from operas she happens to have sung in but a properly workedout programme focusing on the 17th-century Venetian composer Barbara Strozzi. Strozzi never wrote an opera, but the tortured love domain she explored in her ariettas and cantatas is an intense one. Baráth sings six of these pieces, setting them alongside a cantata by Antonio Cesti and a group of arias from the opera Statira, principessa di Persia by her teacher Francesco Cavalli, and the comparison is a revealing one, the confident public art of the two big-name opera composers throwing into relief Strozzi’s more natural emotional truth. The daughter of a poet and librettist, and a regular speaker at his intellectual debating shop, she had no fear of sophisticated literary texts and could respond with honesty, intimacy and a total lack of musical posturing. The affecting falling intervals of her dark laments strike to the heart like a knife, and when there is playfulness it can still work to a serious and wholly appropriate end: ‘L’Astratto’, the piece that ends the programme, shows a love-letter writer rejecting various artificial styles before arriving at his true message – that it is love that controls him rather than the other way round. Baráth’s voice is strong, bright and clear, innately attractive with crisply enunciated words. One might wish for a wider range of colours, and indeed over time she can seem a little full-on in this music; it might just be that, for the time being at least, it is Cavalli’s outgoing operatic world that suits her better. The expert contributions from Il Pomo d’Oro, including short instrumental interludes by Marini and Merula, are typically tight and pingy.